Owning a home is a large, bu rewarding, responsibility. 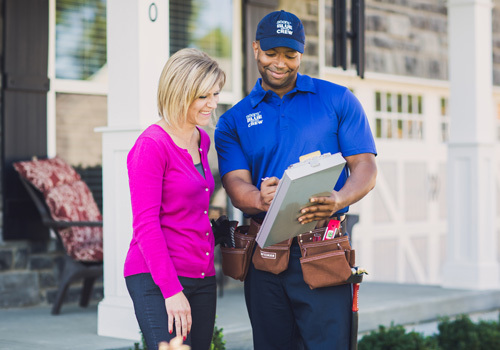 When those difficult and time consuming home improvement projects, renovations and various other repairs pop-up, you can count on a Sears Handyman to complete those for you. The Sears brand stands for trust, reliability and quality and you can sleep at night knowing your repair project will be completed to your expectations and in a timely manner. Our handyman technicians are well trained to complete a wide range of home improvement projects including drywall repair, new deck installation, interior and exterior painting. Give us a call at (412) 799-8772. Are you looking to have some minor electrical work completed that doesn't need a professional electrician? Give Sears Handyman Services a call. Each of our handyman are trained to repair and replace ceiling fans and other fixtures as well as recessed lighting and the installation of LED lights. Did one of your kids or pets just run into a wall or door and put a hole in it? Are you re-arranging a room and need to have those ugly holes left over from pictures and fixtures repaired? We can repair each of those and many other eye sores. Our experienced technicians are well trained in the repairing, hanging, patching or taping of drywall. Decks are frequently the location for parties, BBQ's or relaxing on a warm afternoon or cool evening. Unfortunately decks are exposed to all weather events and high traffic which requires frequent maintenance. Our handymen can power wash your deck, apply stain and repair decking while also taking on a larger project to rebuild or refurbish your deck. Are you expecting a child or have you recently brought home a puppy? Installing a fence will provide you the security and privacy as they play outside. The technicians from Sears Handyman are well trained in installing chain link fences, picket fences or any other decorative fencing that you might have in mind. Give us a call for a quote! Most homeowners want to paint the interior or exterior walls to bring it to life and usher in new colors. Unfortunately painting takes time depending on how many rooms and the size of each room that needs painted. For some, climbing a ladder and reaching up to the ceiling with a roller can be a scary task. Give Sears Handyman a call to get the job done quickly and afforadably. We are also experienced in removing or hanging wallpaper.